MENYELEK , The Storyteller Corp, Jono Pandolfi Designs, Inc. I wanted to bring to the neighborhood a true WhiteBox gallery space where fashion, art and retail brands can showcase their work. 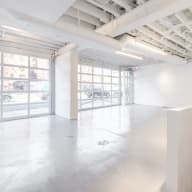 Located in one of the trendiest neighborhoods in Manhattan, this Turn-Key White Box space is perfect for your next Pop-Up idea. Gallery lighting. Sound system. Wifi. ceiling projector. On-site facility manager. downstairs Bathroom. Basement commercial kitchen for cooking and storage.